Yes, spring is just a week away, but winter has not started loosening its grip yet. There are still days that are so raw and cold and windy that I can hardly force myself to get out of the house even for essential errands. When I do, nothing thaws me out and comforts me like coming home to a bowl of hearty homemade soup. I like trying new soup recipes, as regular readers of this blog should know: I’ve published posts about more than 30 kinds. 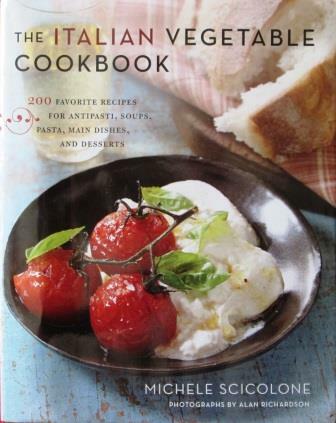 One of my good sources is Michele Scicolone’s Italian Vegetable Cookbook. Its soup chapter contains 19 recipes, several of which I’ve made. I wrote about two of them here. This time around, I tried two more. First I made a simple Barley and Leek Soup, which the recipe said would serve four. I started by chopping two leeks, a stalk of celery, and a carrot, and sauteeing them in olive oil along with a sprinkling of thyme. 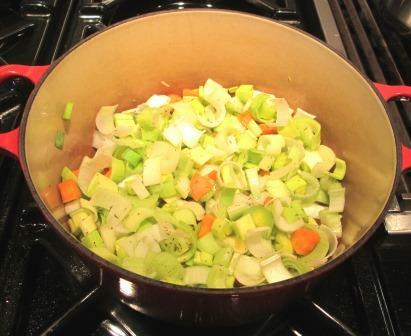 Next I was to add a cup of barley and 6 cups of broth, bring it to a simmer, and cook for 45 minutes, or until the barley was tender. Tom, who had been looking on with a knife expert’s interest while I chopped the vegetables, totally disbelieved the quantity of barley. “That’s going to absorb all the liquid and swell to triple the amount!” he warned. I knew he was probably right, but I was determined to follow the recipe, and I did. It was way too much barley. It swelled to about four times its bulk and indeed absorbed all the liquid, ending up as thick as a risotto. The recipe didn’t even say to cover the pot, but I did, given that long cooking time. It did say I could add a little water if it was too thick at the end. A little? I had to stir in two whole cups of water, just to turn it back into a soup. 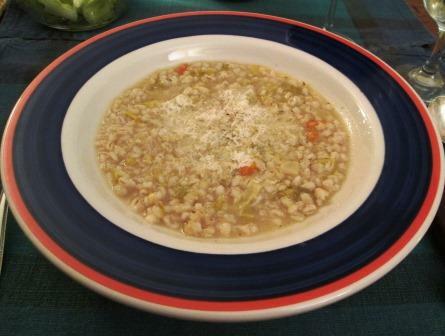 Diluted down, seasoned generously with salt and pepper, and topped with grated parmigiano, the soup came out well. I would have liked the leek to be more prominent: less barley would have made for a better balance. But the soup’s mild flavor and soft texture were very comforting. And it’s a good thing that it was a good soup, because that four-serving recipe made enough for at least eight. Happily, soups freeze well. A few days later, with my soup jones still pestering me, I turned to the book’s Lentil, Potato and Spinach Soup. This recipe was to serve 4 to 6. With caution born of the preceding experience, I considered the fact that it called for a whole cup of lentils and decided to make half a recipe’s worth. This time, I put chopped carrot, celery, and onion, plus rosemary and thyme, into the soup pot with olive oil and cooked for 10 minutes to soften the vegetables. I added a minced clove of garlic and continued cooking for a minute; stirred in half a cup of lentils and a tablespoon of tomato paste; and added a diced all-purpose potato, salt, pepper, and three cups of water. As before, I simmered the soup for 45 minutes, stirring often to keep the lentils from sticking to the bottom of the pot. And as before, the lentils behaved just like the barley and absorbed so much water they made a porridge. I had to add another whole cup of water to bring it back to soup. For the last step, I tore up enough cleaned spinach leaves to pack into a one-cup measure, stirred them into the soup, and continued cooking just long enough to wilt them. At serving time, as the recipe suggested, I drizzled olive oil onto each bowlful. This was also a good soup – a little more complex in flavor than the previous one. 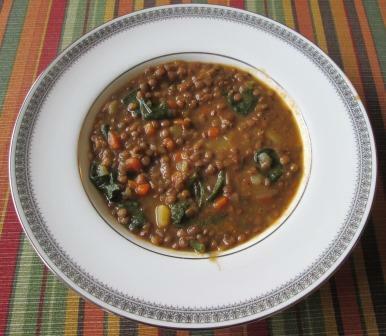 The lentils were the prominent ingredient, with the spinach and potatoes offering nice color and texture contrasts. And, as I’d suspected it would, the “two-serving” half recipe made four generous bowlfuls. I have to wonder if there was a copyediting glitch somewhere in that book. But look on the bright side: With people to feed, a recipe that makes too much is better than one that makes too little. I should have been in Spain today. For months, Tom and I had planned to spend this week in Madrid. Then came the government shutdown. Overstressed air traffic controllers (those who hadn’t called in sick) were working double shifts. TSA screening lines were lengthening. Airplane maintenance crews weren’t working. Flights were being delayed, rerouted, cancelled. Though the shutdown ended (for now), its consequences were still looming. With the addition of potential threats from this winter’s polar vortex, it just seemed that too many things could go wrong with this trip. We’d go to Spain another time. So here I was at home, thinking of the wonderful Spanish food I’m missing. What else could I do but put together a fine dinner from my Spanish cookbooks as a consolation prize? 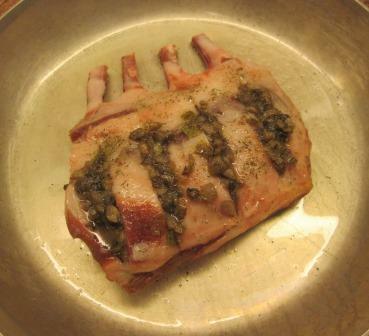 Happily, I had a small lamb rack in the freezer, just the right size to serve two. 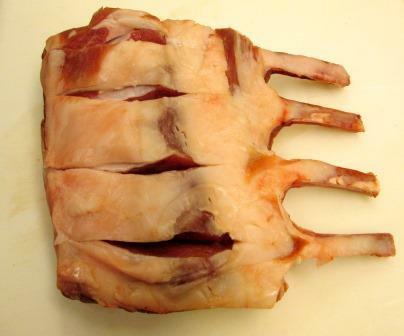 When it was defrosted, Tom carefully cut slits in the meat so that when the chops were cut apart each would have a layer of stuffing in the middle. 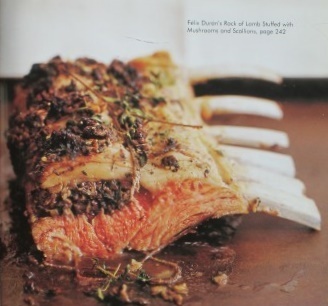 I stuffed that filling into the slits in the lamb rack, put it in an oiled baking pan, sprinkled on salt, pepper, and dried thyme, and drizzled olive oil over the meat. Meanwhile I was also making two easy vegetable dishes to accompany the meat. These were zarrangolo murciano – zucchini stewed with onion – a recipe from Teresa Barrenechea’s book The Cuisines of Spain, and patatas pobres – poor man’s potatoes – from Penelope Casas’s first cookbook, The Foods and Wines of Spain. 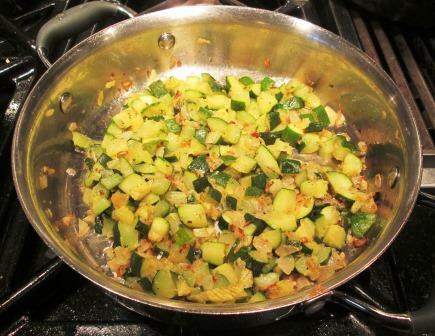 The zucchini dish needed two saute pans: one for slowly softening minced onions and garlic in olive oil, the other for cooking diced zucchini, also in olive oil, until it had rendered up its liquid. That done, the recipe called for draining the zucchini, transferring it to the onion pan, salting, peppering, and cooking everything together for just five minutes. The separate cooking allowed each vegetable to retain its own character, while the final mixing just gently blended the flavors. Now back to the lamb. After the stuffed rack had 15 minutes in a 400° oven, I poured a little white wine and lemon juice into the pan and roasted for 10 more minutes. That was all the cooking it needed. I was pleased to see that it came out looking not totally unlike the book’s picture. 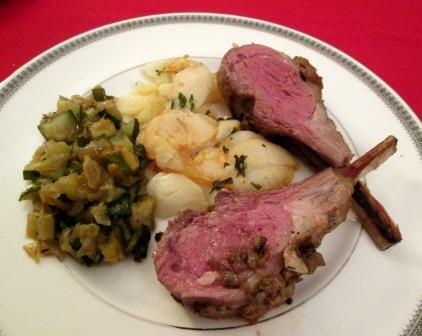 The chops and their stuffing were heavenly together, in both aroma and taste. 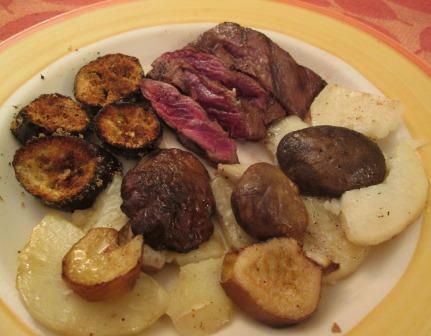 The meat was still rare enough to please two serious carnivores, and the two vegetables made good flavor contributions, with a lightly sweet allium presence knitting the components together. This combination of recipes made a harmonious plate, hearty and satisfying, but with elegance and complexity. 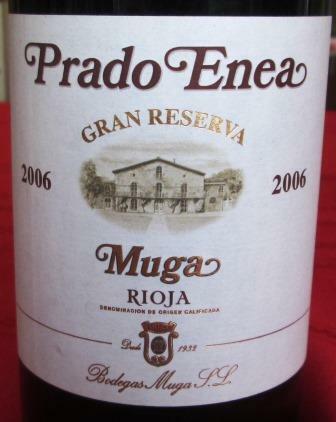 Tom gave us a very good Spanish wine from his wine closet – a 12-year-old Prado Enea grand reserve Rioja from Muga – to drink with the meal. It made an excellent companion to the lamb, being elegant and complex in itself, even though El Exigente would have wished it ten years older. 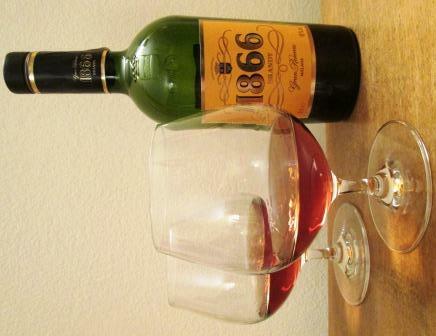 Finally, to complete our consolation-for-Spain meal, after coffee and clean-up we poured snifters of 1866 Gran Reserva Brandy. We discovered this wonderfully intense, aromatic after-dinner drink on a trip to Spain four years ago and brought back a bottle, which we’ve been doling out for special occasions ever since. It isn’t sold in the USA, and the shipping cost from Spain is prohibitive. We’d been counting on buying at least two more bottles in Madrid this week. Alas, it wasn’t to be. One more reason to reschedule that trip! We could have taken our Fourth of July picnic up to a table on our building’s roof garden, but it was still ghastly hot and humid that evening, and since the elevators don’t go up to the roof, we’d have had to shlep food, drink, and all their accouterments up a sweltering stairwell. So our foursome picnicked in the dining room in air-conditioned comfort. 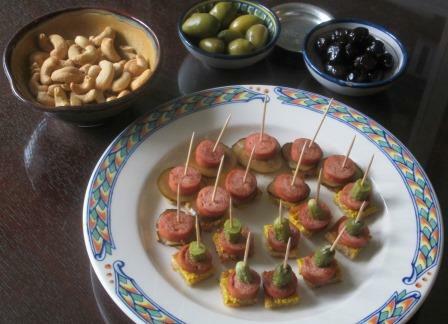 Tom created a dandy little hors d’oeuvre for the occasion – a sort of micro-mini ballpark hot dog. He fried two slices of sandwich bread in butter, spread them with yellow mustard, cut them in one-inch squares, and laid a chunk of frankfurter on each. Half of them received a round of homemade bread-and-butter pickle under the frank, and the other half were topped with a piece of cornichon. Both were very tasty, but we all agreed the bread-and-butter-pickle version had the edge. The main event opened rather elegantly with Galatoire’s Crabmeat Maison. A few years ago I wrote a post about making this specialty of the famous New Orleans restaurant. It’s a luscious dish and always a favorite. After that came the more traditional picnic-y foods. 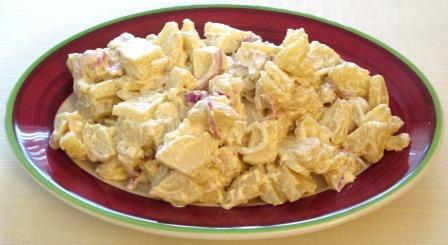 My potato salad, made with the season’s first new potatoes, thinly sliced, a little red onion, olive oil, wine vinegar, salt, pepper, and homemade mayonnaise. 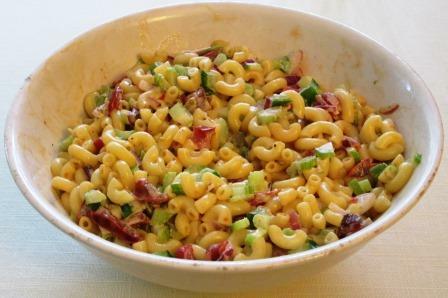 Tom’s macaroni salad, with bits of celery, bell pepper, red onion, and tomato; dressed with olive oil, wine vinegar, salt, pepper, and the same mayonnaise. 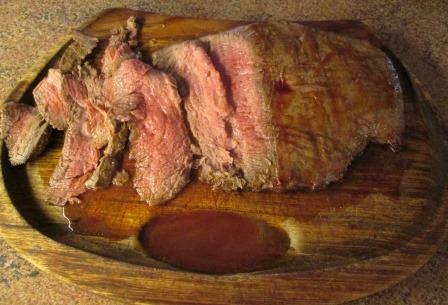 A broiled flank steak with Tom’s minimal barbecue sauce: his own seasoned ketchup, Worcestershire, and chipotle Cholula. 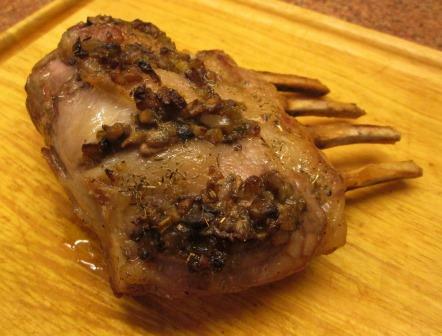 It makes a light coating, penetrating the meat just enough to liven up its own flavor. 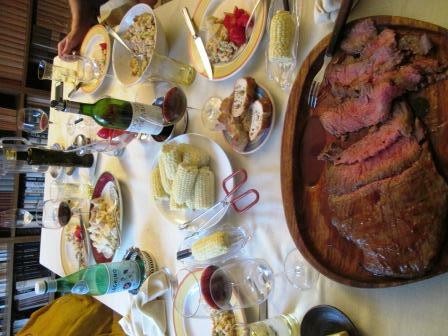 There was also corn on the cob – white corn, first of the season, wonderfully fresh and sweet – chunked heirloom tomatoes, and a crusty baguette; all set out family style and attacked with enthusiasm and old-fashioned boardinghouse reach. To finish the meal we had a nectarine cake, which I make from a Joy of Cooking recipe called Plum Cake Cockayne. 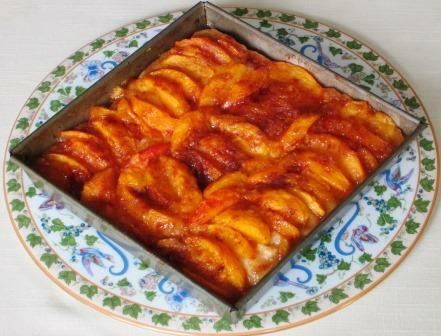 It’s a regular summer dessert of mine, sweet, easy, and good with any stone fruit. It was consumed with alacrity, even though everyone protested how full they already were. That’s the magic of fruit desserts. Octopus, which used to be a culinary curiosity in this country, is increasingly coming into the mainstream of locally available seafood. Three different fish stores within half a mile of my home now carry it regularly, both raw and cooked. 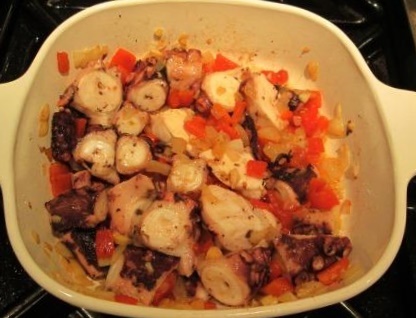 I’ve had very good results from a few Spanish and Italian octopus recipes and am always interested in new ones. 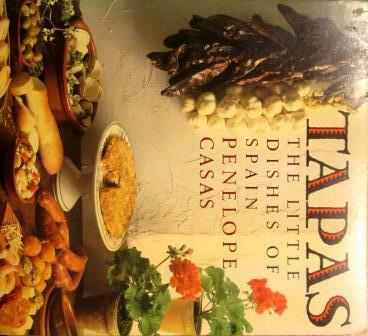 The two latest ones I’ve made are from Tapas: The Little Dishes of Spain, by Penelope Casas. My copy is an attractive large paperback, with more than 300 recipes. Those I’d tried had all been successful, so when I came across two for octopus tapas that I hadn’t much noticed before, I read them with interest. Both have you start by simply boiling the octopus, so for the sake of convenience I bought a pound of cooked tentacles – enough for half recipes of each tapa. The first dish I made was Pulpo con Patatas, Octopus with Red Peppers and Potatoes. The full recipe is said to serve four, but I could see that even the half would be plenty for a main dish for the two of us. 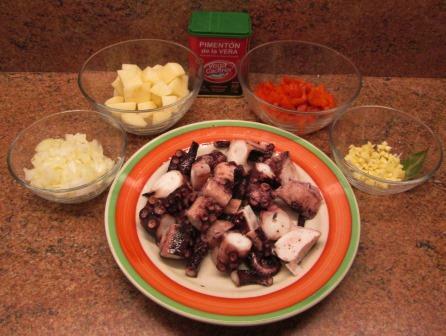 Along with the cut-up octopus, it calls for chopped onion, cubed potatoes, Spanish smoked paprika, skinned and chopped sweet red pepper, minced garlic, and bay leaf. Once Beloved Spouse had done all the knife work for me, the rest of the preparation was easy enough. Boil the potatoes until tender, drain them, and save some of the cooking water. In an ovenproof dish sauté the onion, pepper, and garlic in olive oil. Add the octopus and sauté for a minute or two. Stir in the paprika, bay leaf, potatoes, salt, and a little of the potato water. Bring the liquid to a boil and bake the dish, uncovered, in a moderate oven for 15 minutes. It came out of the oven looking much as it did going in, but the flavors had blended a bit and intensified each other, making a rich, filling combination. This was a good, satisfying dish, but I don’t see it as becoming a regular in my repertoire: Though billed as a tapa, it would have been very heavy as an appetizer; and as a main course it wasn’t quite as satisfying as a few other octopus dishes I’ve made – here and here. For us, those are the upper echelon of octopus cookery. 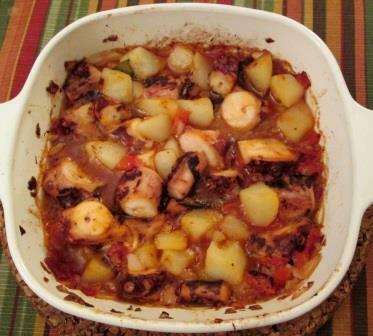 A few days later, I made the second tapa recipe, Pulpo a la Leonesa, Octopus Stewed in Onions. 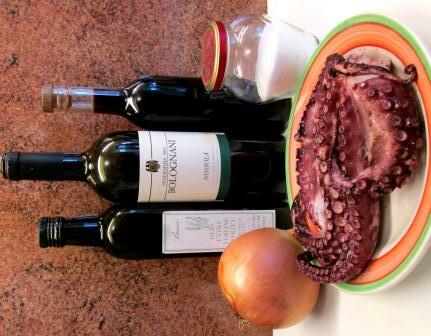 With my pre-cooked octopus, it was the essence of simplicity: aside from the eponymous octopus and onions, the only ingredients are olive oil, vinegar, wine, and salt. 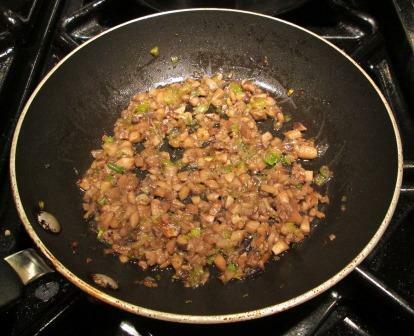 I softened the onions in the oil, covered the pan and cooked them gently until tender. 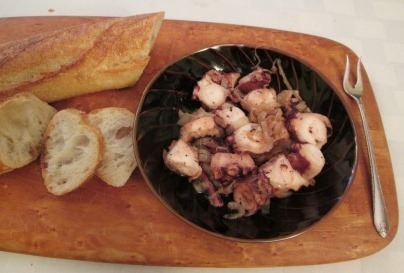 I added one-inch pieces of octopus, salt, and tiny amounts of white wine and my own red wine vinegar; cooked it all gently, covered, for 15 minutes; and served with slices of crusty bread. This dish wasn’t quite as successful as the previous one. Mostly my fault, I think: The recipe strongly recommended using tiny octopi, which would have benefited more from the condiments than my larger chunks did. Also, there was a little too much sameness to each dense, rich mouthful. It would have shown better in an assortment of several tapas, with varying textures and flavors to contrast, than it did as our only appetizer. The onions were extremely tasty, though – we’d have liked more of them. 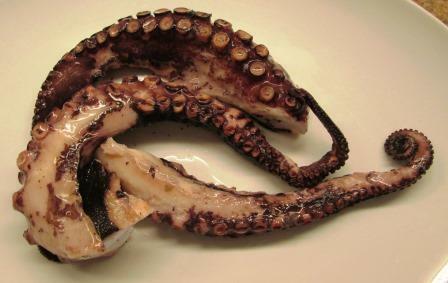 The next time I get an urge for octopus, I might buy the tiny ones, cook them myself, and try this dish again to see what difference they make. And I’ll probably increase the quantity of onions. ‘Tis the season for gastronomical indulgences large and small. 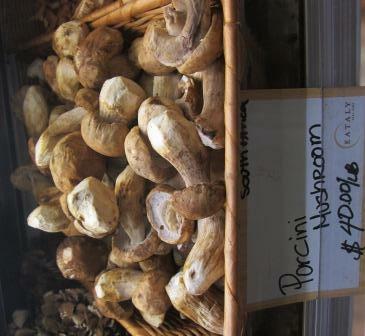 One seasonal treat that’s small in size but large in the amount of pleasure it provides is fresh porcini mushrooms. 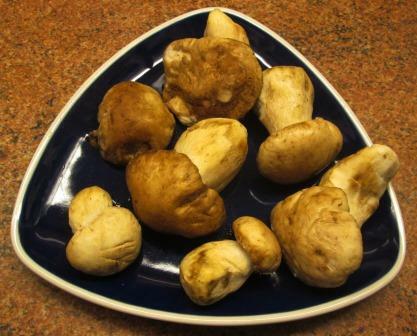 When these fabulous fungi are available in one of my local markets I have to have some, despite their stratospheric prices, because they give distinction to the simplest dinner. The specimens above are practically infants. 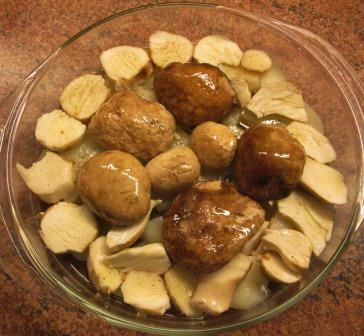 In late fall, restaurants in Italy often display bowlfuls of porcini with caps typically about five inches across. But even the little ones have the species’ depth of unmatchable flavor, so a few almost always follow me home. With this batch, Beloved Spouse stepped into the chef’s role. Some 30 years ago, when he was on a wine writers’ trip in Genoa, he was served a magnificent dish of a huge porcino cap reposing on a bed of thinly sliced potatoes, both slathered with excellent olive oil, apparently oven-roasted and finished briefly under a broiler. He remembers it as ambrosia, and from his description, I’d envied him that experience for a very long time. So, with porcini at hand and his reputation for reliable memory at stake, this week he set about making something like it for us at home. First he thinly sliced all-purpose potatoes, parboiled them for a few minutes, and drained them. While they were cooling and drying, he briefly seethed a sliced clove of garlic in about two-thirds of a cup of olive oil, not letting it color. 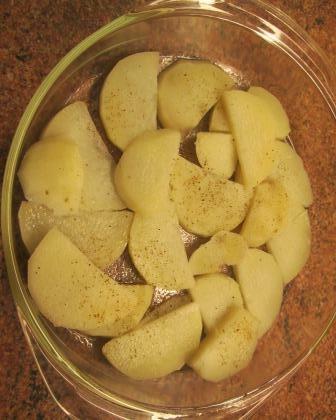 Then he removed the garlic, spread a little of the oil in a gratin dish, and laid out the potato slices, adding salt and pepper. On top he placed the sliced porcini stems and whole caps, brushing everything generously with the garlic-scented olive oil and pouring the rest of the oil around the potatoes. The dish went into a 375° degree oven for about 20 minutes, followed by a few minutes under the broiler for browning. The caps had shrunk somewhat, which slightly marred their appearance, but not at all their flavor. The aroma of the dish was as captivating as its taste. The potatoes loved the porcini, and vice versa. You couldn’t taste the garlic as itself, only as a subtle enlivening of the other flavors. 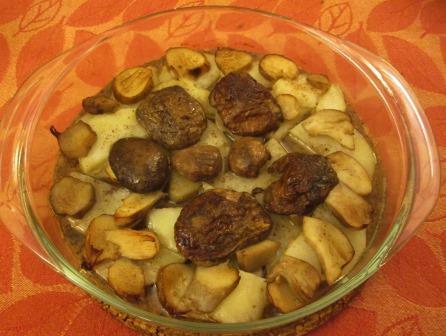 The porcini were transcendent – rich and meaty, a bit suggestive of sweetbreads. This may not have been the legendary dish of that Genoese restaurant, but Beloved Spouse thought it very close, and it turned a simple meal of grilled skirt steak and broiled eggplant into a thoroughly satisfying little feast. I’m encouraging him to keep on experimenting, if he thinks he can improve it any further! I’m very fond of Indian food, but I don’t cook it often. The recipes are usually quite complex, and the flavors seem to want to be matched with others of their kind. Thus, making a full Indian meal is a lengthy, fairly hectic procedure, with many steps to be taken at almost the same time. In an attempt to break out of that rut, I decided, the other day, to put just one Indian dish on an otherwise-familiar American-style dinner plate: a vegetable to accompany a veal chop. 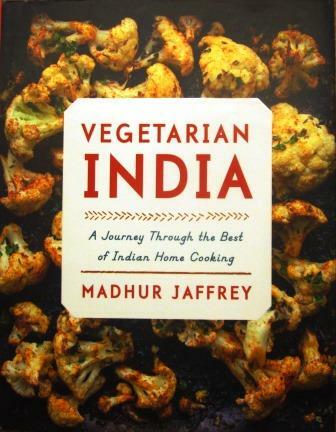 Madhur Jaffrey’s Vegetarian India gave me a trove of recipes to choose from, including one that’s the simplest Indian dish I’ve ever seen: Aloo Gobi, or stir-fried cauliflower with potatoes. Granted, it calls for 10 ingredients, but there are really only a few cooking steps. It seemed ideal. For my half recipe, I first had to boil a potato. (Jaffrey says day-old leftovers do fine in the dish, but I didn’t have any.) When it had cooled, I cut it into ¾ inch dice. 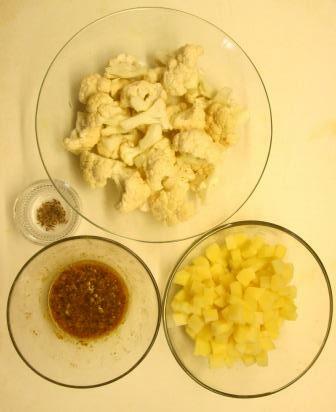 And I cut up half a small head of cauliflower to make a heaping two cups’ worth of florets. Then I stirred up a fragrant spice mixture: ground cumin, coriander, and turmeric; grated fresh ginger root. red chili powder, salt, and water. Those were all the ingredients. 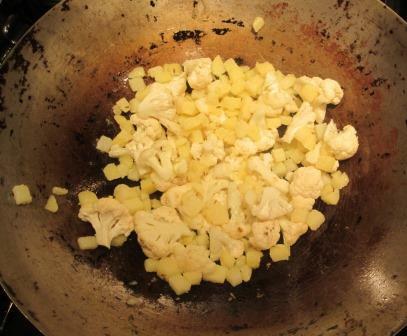 I heated my ancient, disreputable looking (but well-seasoned) wok on a stove burner, quickly sizzled some whole cumin seeds in oil, and added the cauliflower and potatoes. These were to be stir-fried for 10 minutes “or until the vegetables are well browned in spots.” Mine took almost twice that long to brown even minimally. I poured on the spice mixture, kept stir-frying for 1 minute, added some more water, and continued cooking gently. 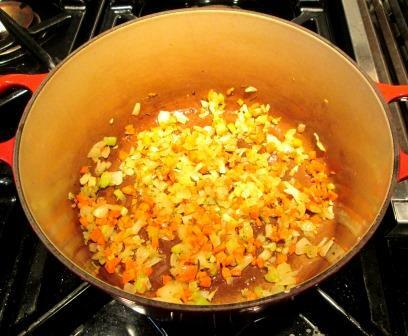 Per the recipe, the vegetables should have absorbed all their liquid and been tender in 2 to 5 minutes. Mine were not. Again, they took about twice that long, and the potato was mushy before the cauliflower was soft. Maybe it was supposed to be that way, since the potato had been fully cooked to begin with? Meanwhile I’d also been cooking the veal chops, using a technique that Tom Colicchio, in Think Like a Chef, calls pan-roasting. I browned them slowly in a little butter for 3 minutes on each side, cooked for 5 more minutes on each side; dropped in a big lump of butter and cooked for a final 10 minutes, turning and basting the chops with the butter. Very restaurantish, all that butter! 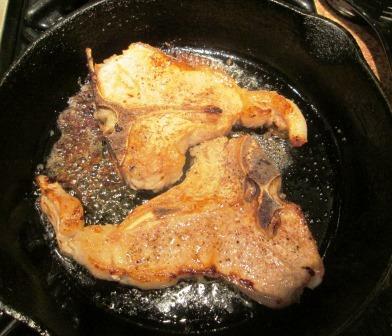 The chops then had to sit off the heat at the back of the stove for 10 minutes, to draw their juices back in. 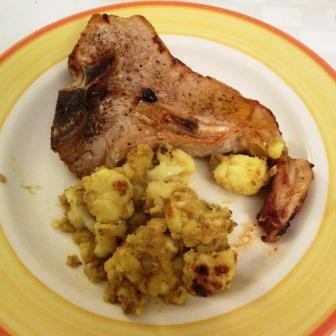 That rest period made it easier to finish the vegetables and have them ready to serve when the chops were. Then came the taste test: inspired combination or culture clash? More like the latter, I’m sorry to say. The aloo gobi and the chop shared a plate amicably enough, and both were good of their kind, but on the palate they didn’t do anything for each other. The veal wasn’t enhanced by the spiciness of the vegetables, and the aloo gobi hardly seemed to recognize the flavor of the meat. Both would have been more pleasing with accompaniments in their own style. (Jaffrey suggests rice, a dal, and a raita alongside aloo gobi.) Beloved Spouse thinks the vegetables would have worked better with a moist braised meat – say, lamb or goat. Well, it was a learning experience for me – to save Indian cooking for days when I have a lot of time to spend in the kitchen, and perhaps when I have a few extra helping hands. However, there’s one potential benefit to the experiment: Since we didn’t finish all the aloo gobi, I’m saving the rest of it to try as a samosa filling. The last week of winter sent us some nasty weather as a parting gift. It has been a peculiar winter hereabouts: many days’ temperature getting up into the 60s, followed by colder spells with lots of wind, then unseasonal warmth again. It had hardly snowed at all until a late nor’easter barreled toward us, threatening Manhattan with 15” or more of snow and wild blustery winds. It was definitely a day to stay home and make soup. I remembered there were some soup recipes in Michele Scicolone’s Italian Vegetable Cookbook that I’d been meaning to try for a long time, so I pulled my copy off the shelf and started looking through it. 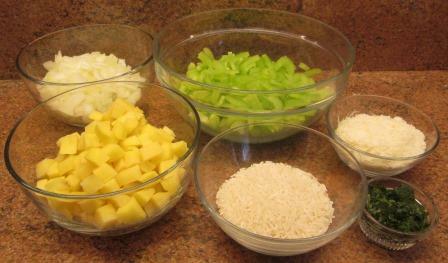 Aha: Celery Rice Soup – the very thing! Beloved Spouse is always eager for dishes involving cooked celery, and I had just bought a large fresh head of it. With that incentive, he was more than happy to chop all the vegetables for the soup. He began working on the four biggest stalks of celery, then moved on to a big onion and two potatoes, while I measured out ½ cup of white rice, grated ½ cup of parmigiano, and defrosted 6 cups of homemade broth and 2 tablespoons of minced parsley. The cooking process was simple. In a soup pot I briefly softened the onion in olive oil, stirred in the celery and potatoes to coat them with the oil, poured in the broth, and simmered everything for 20 minutes. Then I added the rice and some salt and pepper, simmered it for another 20 minutes, and stirred in the parsley. The rice had absorbed a lot of the liquid, making the soup look almost like a vegetable stew. For lunch that day we ate big bowls of it, topped with grated parmigiano. It was a perfect consolation for a mean, snowy, sleety day: hearty, homey, and comforting, with a mild and delicate flavor of celery. 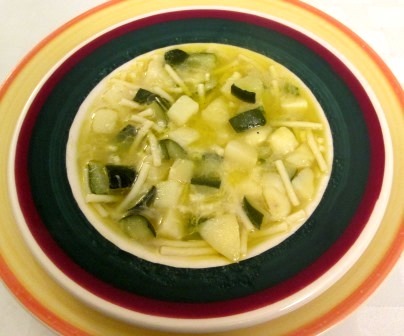 A few cold, windy days later I turned to another recipe from the same book: Pugliese-style Zucchini-Potato Soup. 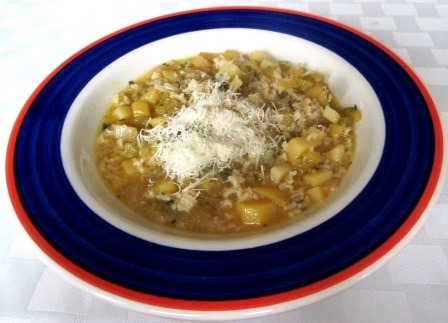 Its ingredients are similar in type but even fewer in number than the previous one’s: potatoes, zucchini, and spaghetti, with condiments of garlic, olive oil, and grated parmigiano. The cooking too is even simpler: Bring salted water to a boil, add cut-up potatoes and a minced clove of garlic, cook 10 minutes, until the potatoes are tender. 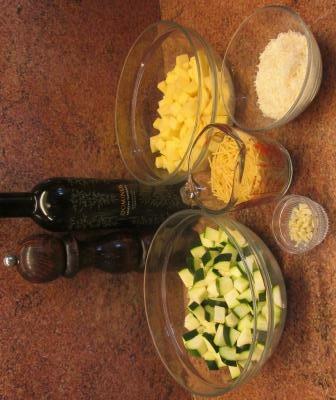 Add cut-up zucchini and broken-up spaghetti; cook 10 more minutes, until the spaghetti is al dente. Stir in olive oil, black pepper, and grated cheese. Serve, passing more olive oil at the table. This minimal peasant soup was, once again, just what the weather needed. 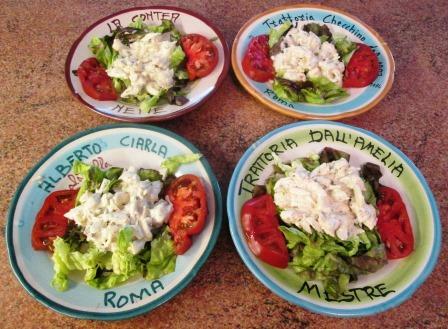 The final dressing of cheese and olive oil completed and enhanced its simple basic flavors. Beloved Spouse said it struck him as a grandmother’s soup. My only complaint was for the blandness of the out-of-season zucchini: They didn’t contribute all they should have to the mixture. But the vernal equinox is past, Earth’s northern hemisphere is tilting toward the sun, the days are getting longer, and soon the growing season will be upon us. And if winter delivers any Parthian shots to us, I can retaliate with the rest of my two soups.